New residence features bright airy spaces, panoramic views, walls of glass that blur the line between inside and outside, and peace of mind provided by 2GIG. 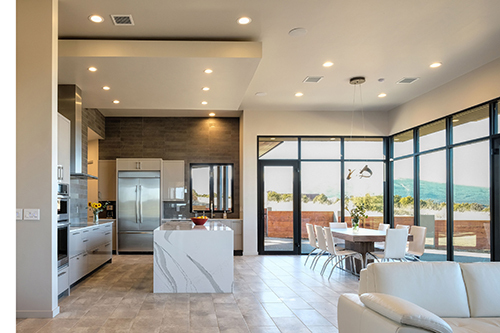 CARLSBAD, CALIFORNIA – When Andrew and Crystal Glen decided to build a new home just east of Albuquerque, New Mexico, they worked closely with a builder and architect to achieve the modern minimalist design and architecture they wanted. 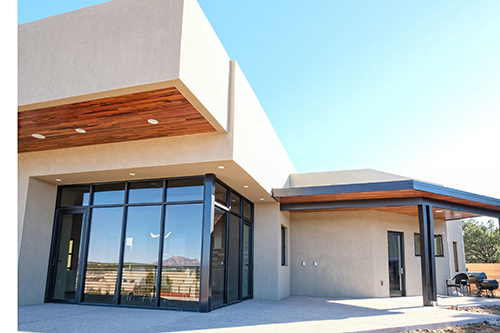 Even though they started from scratch to build their new “dream home,” they decided to take something familiar with them: the reliable 2GIG® security system that they had purchased and maintained through the home security professionals at Link Interactive. According to homeowner Andrew Glen, the couple had been so happy with their previous GC2-based 2GIG systems that they didn’t need to consider other brands. They only wanted to upgrade the control panel to the more robust GC3. The Glens purchased their first 2GIG system from Link Interactive nearly a decade ago, and since then they have moved three times. 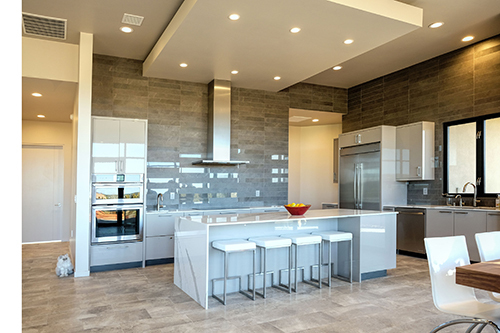 Each time they moved, they were able to take some of the wireless components of the system with them to re-use at the new home, with system design assistance from Link Interactive. After having so much experience with the system, Andrew Glen was able to install some of the equipment at the new home himself, while also hiring a local low-voltage integrator to handle other important aspects. 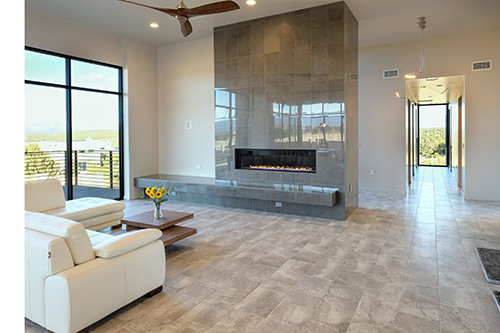 Built by Modern Dwellings, the home was completed in early 2018 and won three awards in the Spring 2018 Homes of Enchantment Parade, a Parade of Homes event organized by the Home Builders Association of Central New Mexico. Featuring a variety of glass and acrylic artwork, a moderately minimalist design, and an open-concept kitchen and living room surrounded by large plate windows that blur the line between indoors and outdoors, the home presents a truly modern aesthetic that the Glens say was inspired by the work of famed architect Frank Lloyd Wright. The Glens enjoy the ability to disarm the 2GIG system remotely when family stops by, and the connected thermostats also allow for remote management of climate. They often use these features to make adjustments after leaving or before returning home, as they both travel frequently for work and leisure. They also monitor their windows and doors with sensors, which they say provides peace of mind that all entrances are sealed and their pets are safe inside the home. The security system uses a number of 2GIG sensors and modules to provide all the features the family requires: Connected to the GC3 main control panel are two secondary SP1 touchscreens, a SMKT3 smoke/heat/freeze sensor, a GB1 glass break sensor, two RE206 garage tilt sensors, and 13 DW door/window sensors. The three individual thermostats were provided by Alarm.com and are fully controlled and monitored through the GC3 panel and mobile app. According to Glen, one incident he will never forget is when their shed at a previous home caught on fire. As Andrew rushed out to attempt extinguishing it using a hose, Crystal was able to quickly alert the local fire department through the 2GIG panel and Alarm.com monitoring service. They arrived shortly after and successfully put the fire out before it was able to spread. All photos courtesy of Etherdox Photography. Nortek Security & Control LLC (NSC) is a global leader in smart connected devices and systems for residential, security, access control, and digital health markets. NSC and its partners have deployed more than 4 million connected systems and over 25 million security and home control sensors and peripherals. Through its family of brands including 2GIG®, ELAN®, GoControl®, Linear®, Gefen®, Mighty Mule® and Numera®, NSC designs solutions for security dealers, technology integrators, national telecoms, big box retailers, value-added distributors, OEM partners, service providers, and consumers. Headquartered in Carlsbad, California, NSC has over 50 years of innovation and is dedicated to addressing the lifestyle and business needs of millions of customers every day. For further information, visit www.nortekcontrol.com.